Welcome to the Luther Forest Technology Campus. Centrally located in New York’s Tech Valley, the Luther Forest Tech Campus is designed and pre-approved global nanotech leaders. 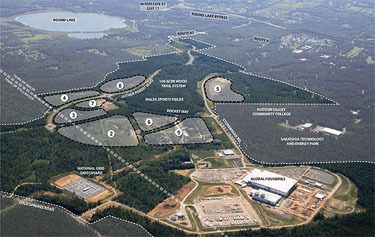 Companies that locate here benefit from a world-class technology infrastructure in a peaceful and relaxed atmosphere. Easy access to R&D assets including the College of Nanoscale Science and Engineering, Global450 Consortium, and International SEMATECH. Close proximity to global nanotech and semiconductor leaders including IBM, GE Global Research, Intel, TSMC, Samsung and more. Luther Forest Technology Campus is home to GLOBALFOUNDRIES Fab 8, the most advanced semiconductor manufacturing fab in the world. Now, we're ready for you.